If you or someone you care for has a disability or mobility issue, you may already realize that you have numerous mobility challenges in your North Georgia home. This is especially true when it comes to the difficulties associated with bathing. But there is hope. There are aging in place designs that can greatly assist in overcoming these domestic obstacles. Which is the most appropriate selection for you, a walk-in bathtub or an accessible shower? Walk-in Tubs: Walk-in bathtubs are a great choice for those who are only mildly restricted in mobility or who require the therapeutic benefits of hydrotherapy for sports or other injuries. The tub has a door which allows for a comfortable and safe access and a generous seat to ensure a comfortable and secure bathing experience. For persons with disabilities who are able to mobilize without a wheelchair, the walk-in bathtub is often preferred to an accessible shower for the home. Accessible Showers: Accessible showers are the answer for those who use wheelchairs or other mobility devices. These showers are level with the floor, making the transition from wheelchair to shower chair as smooth and safe a process as possible, conquering mobility challenges in your north Georgia home. Handicap Accessible Bathtub Shower Combination: A third option, a handicap accessible bathtub shower combination, affords ease of access getting in, and the comfort of using a shower to bathe. So, should you choose a walk-in bathtub or an accessible shower? Determine the needs and abilities of the primary user to ensure the correct choice, and then enjoy the freedom of independent living in your north Georgia home. For additional information, or a free in home assessment for accessible bathroom remodeling needs, please contact Atlanta Home Modifications via the contact form below, or by telephone at 770.880.3405. Do you need other home accessibility upgrades such as a stair lift, vertical platform lift or elevator? Designed for optimum safety and comfort, stair lift equipment solves home accessibility problems. Contact us today for pricing information and to set up a home assessment, at 770.880.3405. A well designed accessible bathroom is unquestionably a great asset to those who suffer from mobility issues in Cobb County. To be able to maneuver with ease through the potential hazards and challenges of a bathroom setting is certainly not something to be taken for granted. So how does one decide which aging in place bathroom design is the best? Accessible bathrooms can provide a number of specific areas of help. Grab bars are inexpensive and easy to install and offer instant stability and support. Non-slip shower and bathroom surfaces give extra traction to prevent falls. Hand held showers and a variety of tub benches give the user control and greater security during use. A roll-in shower makes moving from a wheelchair to the shower a seamless transition. Walk-in bathtubs have a low step entry into a luxurious therapeutic bathing experience. Door enlargement provides ample room for a wheelchair to pass through. Roll-under sinks allow for knee clearance and insulate from potentially hot pipes fixtures. Accessible toilets come in different heights to match the specific needs of the user. Enjoy the confidence of greater safety in moving around your Cobb County home by choosing an aging in place bathroom design suited to your specific needs. For additional information, or a free in home assessment for accessible bathroom remodeling needs, please contact Atlanta Home Modifications via the contact form below, or by telephone at 770.880.3405. You have had a long hard day of work and just want to relax. Or you are recovering from an injury and need the curative benefits of water therapy. Or your body aches and you could use a soothing massage. If any of these scenarios resonate with you, perhaps you should look into purchasing a walk in tub with hydrotherapy jets for your home spa bath. Let’s consider some of the more pertinent facts about hydrotherapy for your Atlanta home spa bath. Hydrotherapy has long been used for the treatment of many ailments and injuries because it offers so many healing benefits. Among other things, it encourages the stimulation of blood flow, carries energy and heat to specific parts of the body, is relaxing and rejuvenating, is safe even for sensitive individuals and takes pressure off painful joints. Hydrotherapy soothes and relaxes sore muscles. Having a bathtub that provides access to this healing spa treatment has never been easier for your Atlanta home. There are many options available for those contemplating the integration of such a therapeutic tool into their lives. Air or water jets, aromatherapy, and in-line heating are just a few of the wonderful advantages available for your home spa bath. Utilizing a hydrotherapy tub can transform your bathing into an experience both relaxing and luxurious. Considering the modern hectic lifestyle, who wouldn’t appreciate a little of that? For additional information about hydrotherapy for your Atlanta home spa bath, or a free in home assessment for accessible hydrotherapy bath remodeling needs, please contact Atlanta Home Modifications via the contact form below, or by telephone at 770.880.3405. Is a Walk-in Bathtub or an Accessible Shower My Best Choice? What are typical Atlanta walk-in tub prices? With a range of pricing options in the purchase of a walk-in tub, Atlanta walk in tub prices that include delivery, installation and finishing may vary from $7,500 to $10,500. An installation in the $7,500 range includes the price of the walk in tub, installation costs and special features or options such as a specialty sized tub and/or hydrotherapy jets packages and more. 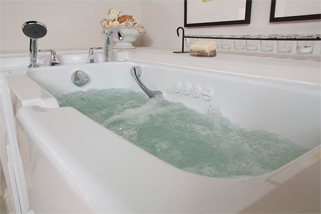 Atlanta Home Modifications, LLC is a reliable walk-in tub provider, offering various tub sizes, hydro- and air jet therapy, chromotherapy, aromatherapy, in-line heater, extensions, fixtures, delivery and installation, as well as a lifetime warranty and excellent customer service – for around $10,000. Does that not sound like a wonderful bargain, and competitive north Georgia walk-in tub prices? Ella’s Deluxe walk-in tub with dimensions of 55-inches wide by 30-inches deep. The installed price begins at around $7,000. With 10 air jets and 12 water jets, a soothing and energizing bath is in store. Ella’s Elite measures 52-inches wide by 30-inches deep, and is priced at approximately $7,600. The Tub King Waterfall model is an economical tub that measures 56-inches wide by 30-inches deep and includes an extra wide door. It is priced around $6,895. Have you been considering the purchase of a walk-in tub for your home, and compared the prices of some of the leading brands such as Ella’s, Tub King or Jacuzzi? You might be surprised to learn that a walk-in tub installation by Atlanta Home Modifications, LLC can be very reasonable, especially when you work with an experienced and knowledgeable company offering competitive north Georgia walk-in tub prices. Increasing numbers of disabled and elderly Atlanta residents are opting to remain independent by remodeling their existing home, thereby taking advantage of the many wonderful aging in place bathroom designs which create safe, accessible and functional space. Grab bars, both horizontal and vertical, are often the first mobility tool implemented. They are practical, easy to install and add a great deal of reassurance concerning bathroom safety. Roll-under and wall-mounted sinks provide easy access for wheelchair users, and offer such benefits as insulated pipes and hot-and-cold water moderation options. Accessible toilets come in a variety of heights and styles, to make use much simpler and safer. Doorway widening is also immensely practical, as this allows a wheelchair or scooter to glide easily, without bumps and potential hazards, in and out of the bathroom entryway. This is either accomplished through the removal of the door and enlargement of the door frame itself, or by putting an offset hinge on the existing door to facilitate more space. If you are trying to determine the best aging in place bathroom design option for your Atlanta home, contact Atlanta Home Modifications for an in-home assessment today, via the contact form below or by telephone to 770.880.3405. Accessible bathrooms are designed to enhance the comfort and enjoyment of any elderly individual, or person with a disability, who wishes to live independently in his own home. When considering upgrading a bathroom, how does one decide which is the best choice, a walk-in bathtub or an accessible shower? Given these distinguishing features, your choice of a walk-in bathtub or accessible shower is largely dependent on the abilities of the primary user. Hydrotherapy therapy soothes and relaxes sore muscles. Americanstandard-us.com for example, has designed walk-in tubs that “… incorporate the therapeutic benefits and luxury of a whirlpool tub, with the safety, accessibility and simplicity of a walk-in bath. Perfect for those with limited mobility who wish to enjoy the freedom of living comfortably at home.” A well designed, accessible bathroom will be a great experience for the independent Atlanta or north Georgia homeowner! For additional information regarding walk-in tubs and accessible showers in the Atlanta metro area and north Georgia, please contact Atlanta Home Modifications by telephone at 770 880 3405. So then, what are typical Atlanta walk-in tub prices like? Interestingly, there is quite a range of pricing options in the purchase of a walk-in tub. Depending on whom you choose to do your installation, Atlanta walk in tub prices that include delivery, installation and finishing may vary from $7,500 to $10,500. An installation in the $10,500 range includes the price of the walk in tub, installation costs and special features or options such as a specialty sized tub and/or hydrotherapy jets packages and more. There is no need to stress about walk-in tub prices. Get an in-home assessment for your Atlanta residence to find out how you can enjoy this high-quality luxury at the absolute best price! Then sit back and relax! Hydrotherapy, or the therapeutic use of water, has been practiced for centuries for the relief of pain, improvement of blood circulation, and general relaxation and well-being of the individual. In the past, one had to travel to specific geographic regions in order to benefit from the healing powers of water. Now, through modern advances in engineering, hydrotherapy jets are available for your Atlanta home spa bath. What exactly is hydrotherapy? What are its benefits? Massaging hydrotherapy jets are typically included with the installation of a therapeutic walk-in spa bath. These spa jets come in different forms, or strengths, and offer singular health benefits, the particular selection of which is dependent on the needs of the primary user. Whirlpool or air jets release air bubbles into the bath water, supplying a gentle massaging action, and is perfect for those with sensitive skin issues. Hydrotherapy or water jets continuously recirculate the water in order to promote a stronger, more forceful massage sensation, offering special relief for such ailments as arthritis, circulatory issues, and chronic pain. 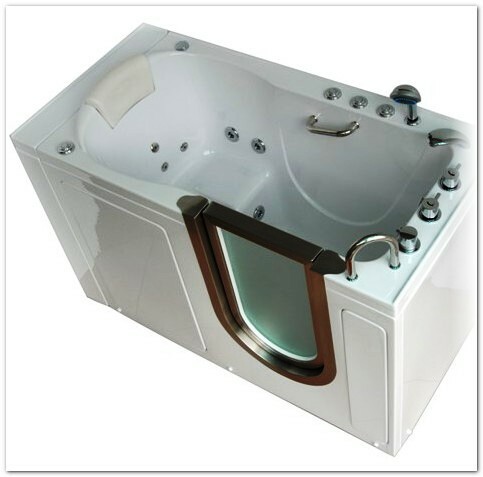 There are therapeutic hydrotherapy jets designed to meet the specific needs for your Atlanta home spa bath! Discover yours today! Now universally considered an essential design strategy, aging in place home design has many benefits. Beginning with the wisdom of investing your home dollars in a home that will last for many years, to the value of being able to age in your home whether in Atlanta, Marietta, Athens or Macon, with dignity; and finally having the freedom to be mobile and retain a lifestyle you value —incorporating aging in place design strategies is simply smart. With the benefits of wise investments, aging with dignity, preserving your freedom and mobility – aging in place design simply makes sense. An excellent article from Next Avenue highlights the topic, ‘8 Things to Consider Before Remodeling to Age in Place.’ Addressing everything from stair lifts to walk in tubs, the article covers the ‘ins and outs’ of one-floor design vs. elevator, no-step entry, widened doors, pocket doors, stair lifts, walk-in tubs, built in shower seats and glass shower doors. More and more people are choosing to age in place rather than move to an assisted living community in Atlanta, Marietta, Athens or Macon. Converting your house to one which is safe and accessible can be time consuming, but there are many options available which will make a significant difference. The first place to start is to have an aging in place home assessment to assist with stair lift, ramp or other mobility equipment selection. Regarding chair lifts, Nextavenue.org says that the stair lift is one of the most common pieces of aging-in-place equipment… The most basic straight chair lift (the kind that runs straight up and down) costs about $3,000, installed. Custom curved units for stairs, that have turns and landings, can run as high as $12,000. While glides with seats can be a godsend for people with heart conditions or bad knees, they are not ideal for people with bad hips or who have difficulty sitting or balancing in a seated position. A perch stair lift, or standing lift, will be required for these people. For more information about stair lifts or bathroom remodeling including walk-in tubs and spa bathtubs in Atlanta, Marietta, Athens or Macon, please contact us by telephone at 770-880-3405. Provide contact information below, and we will contact you by the next business day.